You may loose impact hits, but the thundertusk is much more a support monster with its stone thrower freeze blast and 6" freezing nuts aura. Thats where the points are sunk. So from your experiences so far Pete the Thundertusk is the better option of the two if you could only go with one? 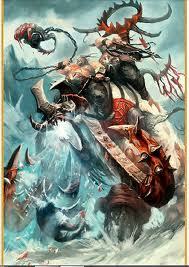 Personally I like the Stonehorn model the best, but can see the value of the Tusks abilities. Both are a bit 'meh' but add a nice bit of variety. When I used a Thundertusk it only survived until turn 2 twice... enemies with Cannons just saw easy points. When it did survive I found the 'ice freeze' very tricky to use to get in range. Best thing for them though, is when in range of bubble-regen etc... can make them very good.